NC30 HRC carburetor setup. The velocity stacks are replaced with HRC short rubber boots. The airbox is discarded for this configuration (no air filter either). 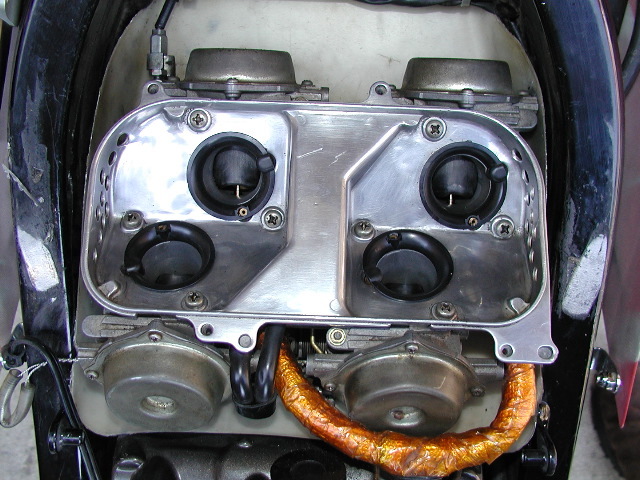 Instead, the white HRC tray is placed beneath the carbs. The "airbox" is made up of the cavity between this tray and the underside of the fuel tank. Note the holes drilled on the side of the metal bracket, and the ribbing is removed between the intake pairs.